Kaman Inc., a world leader in the design and manufacture of high-performance and high-precision non-contact position measuring systems has announced a cost-optimised PCB version of its popular and well proven KD-2306 series eddy current linear displacement instrument for integration into volume OEM applications requiring precise linear measurement. The OEM-2306, available with full support from Kaman’s UK distribution partners Ixthus Instrumentation Ltd, is factory configured and calibrated to specific customer requirements and paired for use with any of the comprehensive range of Kaman Eddy Current sensor models. 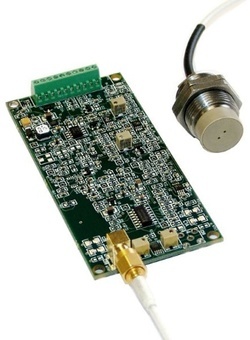 Designed for straightforward installation and easy integration into the customer’s machine, the compact board includes connectors for single- or dual-coil sensors and front accessible course and fine calibration controls plus screw terminal I/O connections. Options include non-standard range/target material, temperature compensation, hermetically sealed cable connection and more. Kaman’s eddy current sensor range includes over 30 dual and single coil models in shielded or unshielded designs for precision measurement from 0.5 mm to 60 mm and with typical resolution to 0.01% FS and linearity to 1% FS. These high resolution displacement sensors can be selected for operation in air or through various non-metallic materials and to suit temperatures ranging from cryogenic to +200 ºC. A wide choice of cabling and connection options are available with further customisation available for volume applications. Minimum specifications for the OEM-2306 will include a resolution of 0.01 %FS and non-linearity to less than 1 %FS. A 50 kHz frequency response ensures fast data measurement and output options of 0-10 VDC and 0-5 VDC ensure flexibility in use. Kaman’s eddy current sensors and compatible signal conditioning electronics are a compelling and cost effective alternative to LVDTs, air gauges, dial indicators and micrometer measuring systems. With the ability to withstand the harshest of environments, the robust and durable sensors feature an inherently long life and require extremely low maintenance. Applications span research and industry from engine dynamics to machine tools and from semiconductor manufacture to packaging machines.